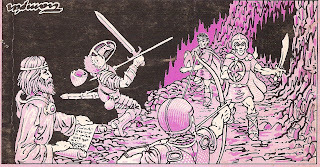 The irreplaceable Trent Foster has kindly scanned four images from the pastel-colored editions of the Giants-Drow modules, which I now post here: This is a nice Sutherland piece that shows the Drow and their pack lizards, something that doesn't get illustrated very often for some reason. Here's another example of "white Drow" and the likely model for the Jeff Dee (?) 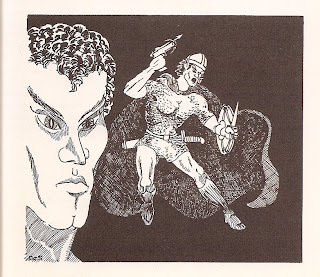 illustration that appears in the later printings of the module. 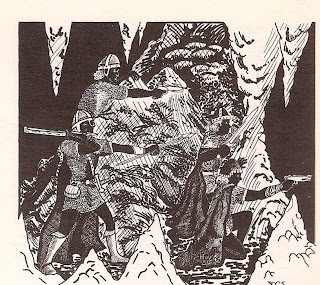 This is a rare Dave Trampier illustration of the Drow, although they aren't recognizably dark elves in my opinion. Only the bucklers give them away. This is a rather well-done DCS piece showing a collection of Drow warriors, using both hand crossbows and atlatls. I like it a great deal, since the blackness of the Drow's skin is made very clear here and it's quite unsettling. On the subject of the "white Drow," I wonder if perhaps, early in their conception, the Drow were, like many subterranean creatures, assumed to be albino or at least very pale in their skin color. That would make sense and would be another connection to Elric. I know that when I re-imagined the Drow in the late 80s for my home campaign, I made them a race of ghostly, albino elves because I thought it "made more sense." I have no support for this theory, but I do wonder if there might not be some truth to it. The Shadow Elves of the Known World/Mystara (the default setting of BECMI D&D) were assumed to be albino, with extraordinarily long ears. Culturally they were also quite distinct from the Drow. IIRC, the Castles & Crusades Monsters & Treasure entry for Dark Elves describes them as either jet black or albino in color. Even back then I recall wondering, "black elves as in black magic, or literally black?" Even the "dark as faeries are bright" might have been poetic. After all, Tolkien's dark elves were not black skinned either. Of course, eventually the art work of subsequent publications seemed to settle the question, but I too wonder if the Drow started out that way. 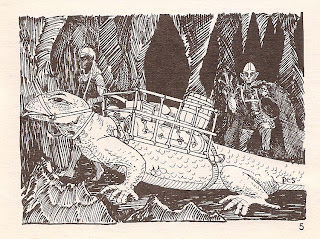 I think that the logical implications of the subterraneans is often reached, whereas the metaphoric implications of their darkened spirits is less accessible to more modern sensibilities, however taken those sensibilities may be with the general magical nature of things in the game. Again, the universally curly hair in those earliest pieces communicated very clearly to me what their skin tone was. The Trampier piece was used in advertisements for the D-series in early Dragon magazine issues. That Trampier piece is excellent! It's very dynamic, with the fighter's helmit flying off as the javelin hits him. I like it! D&D art is always more effective when the party is getting the short end of the stick. I always imagined elves to have a sort of inverted melanin: The more sunlight, the paler the skin, the less sunlight, the darker. Thus Faeries were milky white and Drow were pitch black. I love the DCS piece with the warriors waiting for ambush. Really good representation of what they should look like and their tactics. I always been a fan of the ebony-skin Drows. I remember seeing the Drow from the 2e era, and I never liked how they used African skin tones. I have always pictured them as having obsidian skin, with a blue gleam. It both unsettling, and mysterious! I also never liked albino Drows. Back in the day, I got it in my head that the drow were albino, but used soot or coal to color their skin for camouflage in the underdark. You gotta love giant pack lizards! The redrawn version of the second picture posted here is not by Jeff Dee, but by Jim Roslof, I believe. Is it just me, or is the adventurer's arrow placed on the wrong side of his hand (in the Tramp picture)? No. He's using a traditional bow. It's correct. The Equivocal Meaning of "D&D"